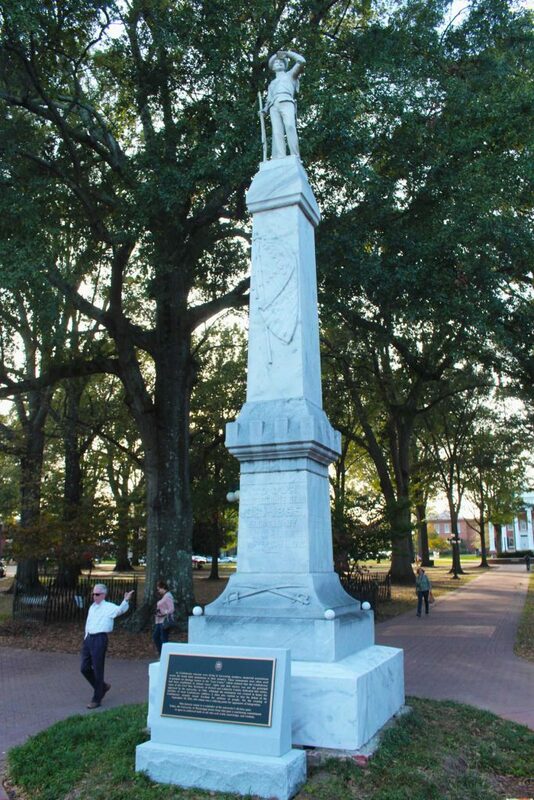 Student leaders at the University of Mississippi are taking steps toward removing its Confederate statue from the center of campus. Student leaders met with campus historians and administrators this month to discuss options for removing the university’s Confederate statue from the Circle, and on Tuesday night, Associated Student Body senators approved a draft of a resolution in committee which would call on university administration to relocate the statue. The statue, erected in the Circle 1906 and paid for by residents of Lafayette County, served as a rallying point for neo-Confederate protesters this past weekend. In 1962, students rioting against James Meredith’s integration of the university gathered at the base of the statue. According to a memo dated Feb. 26 released by the Associated Student Body Senate’s committee on inclusion and cross-cultural engagement, senators plan to seek support from the Faculty Senate, Graduate Student Council, Staff Council and administration in order to relocate the statue to the town’s Confederate cemetery. These groups represent some of the same university bodies who were involved in the school’s decision to remove the state flag from campus in 2015 and to remove Ed Meek’s name from the School of Journalism of New Media in 2018. In October 2017, Deputy Attorney General Mike Lanford said the university’s Confederate statue could be relocated as long as it remains on public, county property. The ASB rules committee will review a draft of a resolution calling on the university to remove the statue before that legislation potentially comes to the senate floor next week. In addition to meeting with official campus councils, senators met with other student leaders, including College Democrats and student ministries, to bolster support for relocating the monument. The ASB memo shows that senators met with former members of the Chancellor’s Advisory Committee on History and Context and other experts on campus race relations from the William Winter Institute and Center for Inclusion and Cross-Cultural Engagement. The Daily Mississippian will continue to report on this developing story.